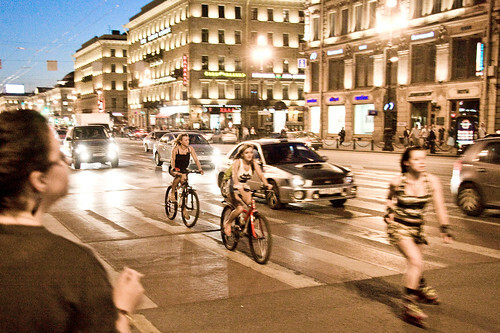 The life of bicycles in St. Petersburg explodes at night. During the day the city is a hellhole of Soviet traffic planning, but in the summer evenings, after the suburbans have driven their cars out to pasture, the bicycles really come out to play. Above, classic Cycle Chic and, as an added bonus, rollerskate chic. The weather was warm and lovely on the Friday evening I was there and what I found amazing was not just the number of bicycles but the number of people, in general, who spill out into the streets and keep them filled all night long. In front of the Winter Palace, on the massive square, there were groups of bike gangs, scooter gangs, rollerskate gangs and motorbike gangs, all hanging out and trying stunts and being sociable. The bicycle was used in all the same ways as it is elsewhere, which was wonderful to behold. Friends riding together, couples doubling from one bar to the next, you name it. 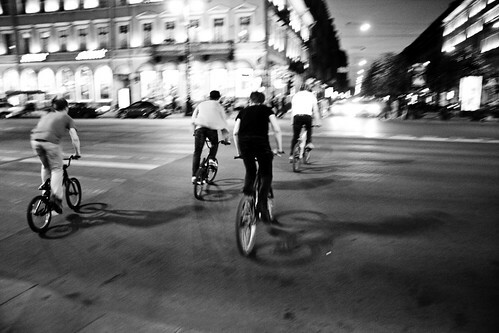 There were many groups of four or five friends on a variety of bicycles, enjoying the summer nights and the freedom that the bicycle provides. 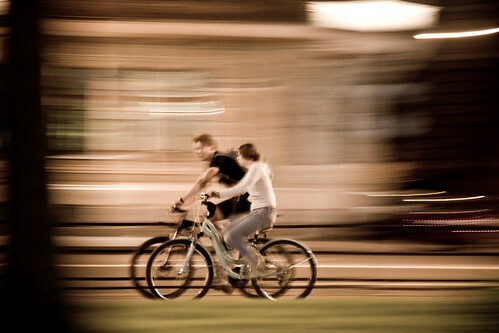 Here's a couple riding along the river, heading for what appeared to be the Main Event on Friday night in the city. At 01:26 in the morning the drawbridges on the river were scheduled to go up, in order to allow the big ships to enter and leave the port. Amazingly, there were thousands and thousands of people lining the river, waiting for it to happen. There were cheers when the bridges started to rise. 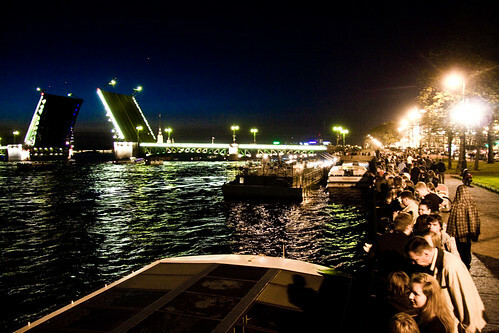 Dozens and dozens of small boats bobbed on the river, as well, filled with summer revellers. Even though they didn't need a raised drawbridge to get past the bridge, when the bridges started rising, they all sped towards it and, symbolically, passed under. 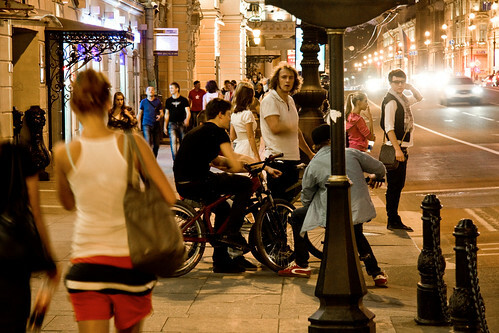 It was wild to see so many people out on the streets at that time of night. The city was truly Dr Jekyl/Mr Hyde. On summer nights the people reclaim it as their own. All night long. I totally had the same experience in St P - it's dour and unfriendly by day but really comes to life at night. The clubs are off the scale too. You've got to be careful about that bridge though, in mid summer they go up and stay up all night which meant in my case I couldn't get back to my accommodation on the South Bank. Which is why I didn't leave the nightclub till about 7AM... oops. 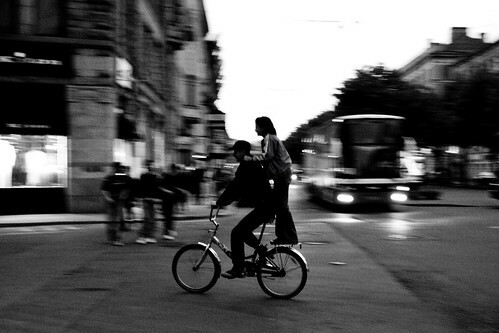 Great pictures Mikael, it's so great to see the ways in which the bicycle is being used all around the world. I envy your itinerary! Great pictures.....it must be very different in winter. Here's a bike for you. Well suited for that weekend shopping spree. The Soviet system has a lot to answer for, but surely not the traffic hell of modern day Russia. In the old days - when there was a five year wait to buy a Lada - there simply weren't many cars on the road. Public transport ruled. The traffic madness, like the economy, is just a particularly unregulated example of crony capitalism replacing state capitalism.